At Bengeworth we have a ‘More able and talented’ (MA&T) policy to ensure that those who fall on our MA&T register are having their needs met in terms of being challenged in the classroom, ensuring that work is differentiated, as well as providing opportunities to participate in extra learning opportunities both during and outside of school hours. The More Able and Talented Graduated response is slightly different at Bengeworth (see below). How do we support this? In class work is differentiated for pupils meaning that different levels are challenge are provided in class. Children can opt for more difficult work if they feel confident enough to do this. 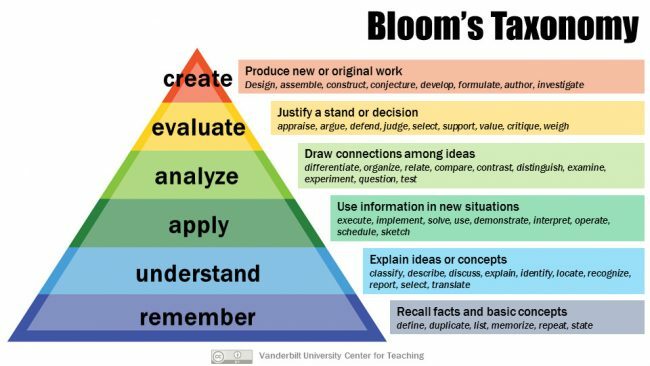 Teachers can extend work for the more able pupils through the use of higher level questioning and activities that are aimed at the top level of Bloom’s taxonomy model (see image below). Additionally, pupils who are more able may be able to tutor and help others in class once completing work as well as getting on with work as soon as it is set rather than listening to teacher instruction. Workshops Half or full day workshops are run in school or at another local school for pupils with guests and teachers that specialise in particular areas e.g. science, maths, authors etc. Sports Coaching At Bengeworth we have a specialist sports teachers who provides after school sports club throughout the year. Some of our pupils who are more able or have a skill in a particular sport can help out at these after school clubs and teach/coach other pupils alongside the teacher. Art Development Identified pupils have worked with a local artist to create bespoke pieces of art that are now displayed in our school. Maths for the More Able has been created in association with NACE: the National Association for Able Children in Education and is underpinned by the quality standard for gifted and talented teaching and learning. This programme has activities designed to deepen children's understanding and get them reasoning at a higher level. If you believe that your child may have a particular talent in a subject or skill then please contact the school about this as we would love to know what your child might do outside school. - Encourage them and support them in the children’s University scheme, includes taking pupil on educational visits e.g. to gallery’s, museums, workshops or completing the activity sheets provided by school. If you would like to inform us of an ability, gift or talent that your child demonstrates to a high degree of proficiency then please complete and return the form attached to the letter below. Hoagies - Links for both parents and children with activities and reading http://www.hoagiesgifted.org/ to others views and opinions.